At a recent stay at the Hotel Kabuki in San Francisco, I was handed a half-bottle of Kenwood Sonoma County Cabernet Sauvignon 2007 as an amenity of their Joie de Vivre club. It was a screw cap bottle (handy to not have to deal with the whole corkscrew thing if you are handing out bottles of wine to your guests). Although I wasn’t expecting much, this Cab proved to be not only inoffensive but rather tasty. The aroma was of ripe berries with tobacco overtones. It had a fruity raspberry and strawberry flavor, with quite a bit of oak, a hint of chocolate, and robust tannins. Either the JDV chain got lucky, or they actually put some thought into this selection. This Kenwood Cab is inexpensive, though not in the Two Buck Chuck or Barefoot range. Most importantly, it’s fruity enough to please just about anyone while it sports enough complexity to avoid disaster with a more experienced wine drinker. Plus, it was immediately drinkable, though a little air seemed to bring out more complexity. All in all, it was a very nice welcome to the hotel, and it’s a wine I’ll look for at the wine store. 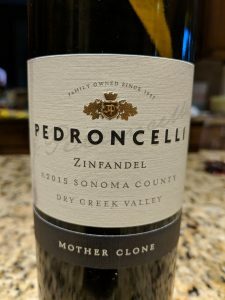 This entry was posted in Cabernet Sauvignon, Red Wines, Wine Reviews and tagged kenwood, sonoma county on January 25, 2011 by Roger.